Hello everyone! I'm new to this, but I want to share this with all of you so you can look at it and maybe try it. This is what I made with three hours of tinkering. I think it looks rather like Ubuntu Kylin; which I love; but keeps the MATEy feeling. and then set it to Square. To do this, I went to System > Preferences > Look and Feel > MATE tweak. Then I changed the interface to Munity. After doing that, I set the side panel to the bottom by right clicking on the left-hand panel and setting the preferences to put it at the bottom. I restarted the laptop after that because it caused some graphical errors along the top, but maybe that's just me. After that, I added the Logout and Power buttons to the bottom panel, and removed the workspace switcher after unlocking it (right-click). The panel at the top, which I now call the Wing Panel; I set the preference (right-click) to auto-hide itself. I removed the power button from it, and moved the clock into the middle, and added a complex menu to the left-hand side. I also added a two-workspace switcher to the right-hand side. 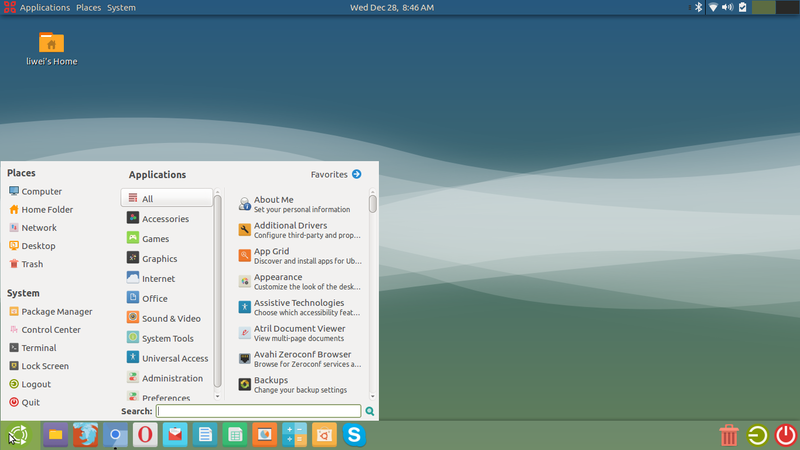 I removed the menu button that came with the dock at the bottom (it's a little too LxDE for me) and then replaced it with a advanced MATE menu (using right-click, add to panel). I changed the menu logo by going to Google and downloading a transparent image of the Ubuntu MATE logo, and using resizeimage.net to resize it to 50 px by 50 px (use right-click, Panel properties, and then look at the size to figure out how big you should resize it). Then I right-clicked the menu logo > Preferences, deleted the text that said Menu, and implemented the new image. Chromium and Opera for browsers. Minetest and Neverball and Neverputt for gaming. (I will put all of this into my post).